Donald Trump’s popularity has increased since he was elected president, according to a new Morning Consult/POLITICO poll. 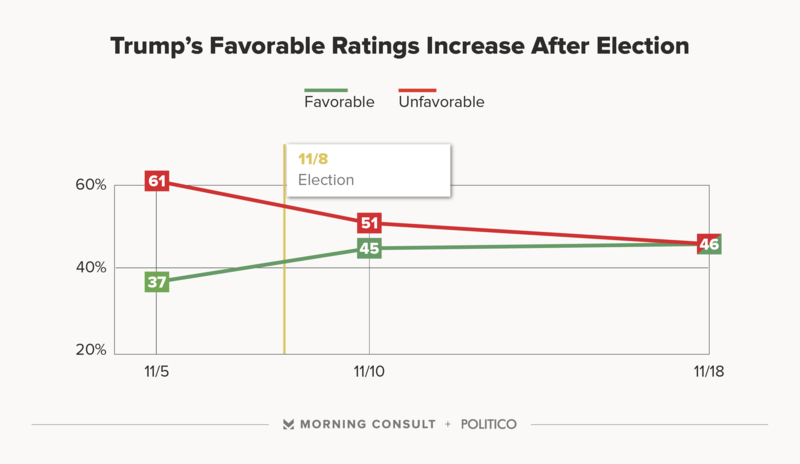 In a Morning Consult/POLITICO poll taken just before the election, 37 percent of voters said they had a favorable view of Trump, while 61 percent reported an unfavorable view of the then-candidate. After the election, the number of people reporting an unfavorable view of Trump dropped 15 points, to 46 percent. Trump also saw a nine point increase in voters saying they had a favorable view of him, also to 46 percent. See the full results from the latest Morning Consult/POLITICO poll here.